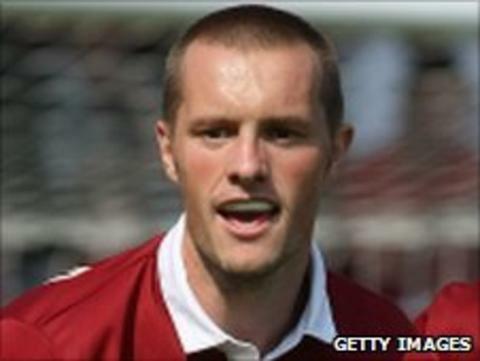 Northampton Town striker Shaun Harrad is expecting to get a new lease of life after the arrival of Adebayo Akinfenwa. The 29-year-old frontman returned to Sixfields in May following a season with Gillingham. "I'm looking forward to a fresh start and knocking in goals with the big man," Harrad, a January signing from Burton, told BBC Radio Northampton. "I was really excited when Bayo signed. Two defenders were marking him [against Burton], it frees up someone like me,"
Akinfenwa scored 37 times in 88 league games over 18 months for Northampton before heading to Gillingham last summer, where he found the net a further 11 times. Harrad, 26, hit 22 goals for Burton in 2009/10, and notched 19 last season, eight of which were for the Cobblers. He has yet to score in pre-season after playing for an hour in Northampton's 2-2 draw at Oxford City and half-an-hour in the 1-0 defeat by Brackley Town. "We want to win games but it's not the be-all and end-all," he added. "It would be nice to get a goal out of the way but the most important thing is to get your fitness and sharpness." Harrad faces competition from former Shrewsbury forward Jake Robinson and potentially Tadhg Purcell for a starting place, although Purcell has been linked with a move away on loan. "We all know there'll be stiff competition because we've got a good squad."